Please don�t think of us as merely a scaled down version of the Standard Schnauzer, because we have a distinctive personality in our own right. We miniatures are the smallest of the three German Schnauzer breeds and one of the most popular companion dogs in the entire world. Our harsh, rough coat comes in salt/pepper, black and silver, and solid black. It requires grooming to keep that famous �look�, and it also needs combing regularly to keep the longer parts from getting tangles. One really good thing about our coat is that it is virtually non-shedding, making us a great pet choice for those who suffer from asthma or other allergies. When fully grown, I am between 12 and 14 inches tall (30.5 to 35.6 centimeters) and I weigh between 13 and 15 pounds (5.9 to 6.8 kilograms). 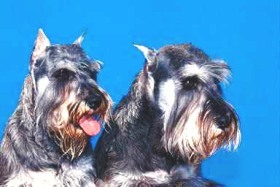 We have no Miniature Schnauzer Breeders listed at this time. Click here to place your Miniature Schnauzer Ad!